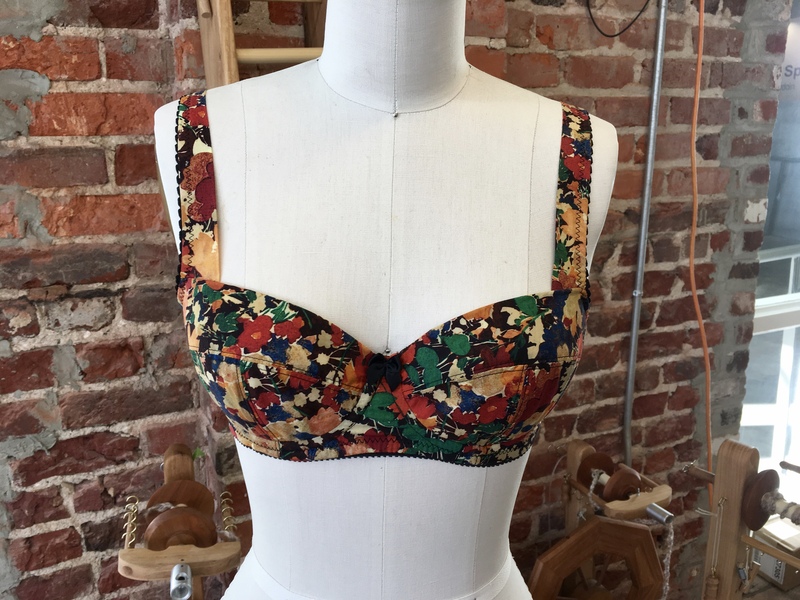 I made another Boylston Bra; this time in a very special Liberty tana lawn that was gifted to me by a close friend. There isn’t much to say about this one since I just finished my previous version. Though, I will say that somehow, the top of the upper cup is almost a teeny tiny bit too snug on this one. This could normally be attributed to simply using a different fabric, but given that there is foam underneath, that shouldn’t be the case here. My best guess is that I did not accurately document the changes I’d made to the cup the first time around and the pattern for this version is just a tad different. C’est la vie. In addition to the gorgeous Liberty fabric, I used black lining and power net that were left over from my bra-making class at Camp Workroom Social, plus hooks, eyes, sliders, rings, and elastics from a “Small Findings Kit” and foam from Bra Makers Supply. My one peeve with the two Boylstons I’ve made so far, is that they are not invisible under clothing. The seam lines across the cups and top edge are not smooth. I know this should not bother me – everybody knows I am wearing a bra under my tops – but I do not like visible seam lines from underpinnings. My next bras will have lace along the top of the cups to try to minimize this. The strap elastic in the Bra Maker’s Supply Small Finding Kits is wider than I was expecting. I don’t love the way it looks, but by golly it is stable. I haven’t attempted to cover the seam lines between the three pieces of the foam cup with tricot strips yet (despite the fact that Amy from Cloth Habit has a superb video all about it). It seems (ha!) to me like that would just add bulk, potentially making them even more visible from the outside. But I have not ruled out trying it on a future version. That wraps up my Boylstons for now. But don’t fret, I finished a new-to-me bra pattern over the weekend that I’ll be sharing soon. Modifications: I took the changes I made on my first version and attempted to make them to my pattern pieces with moderate success. 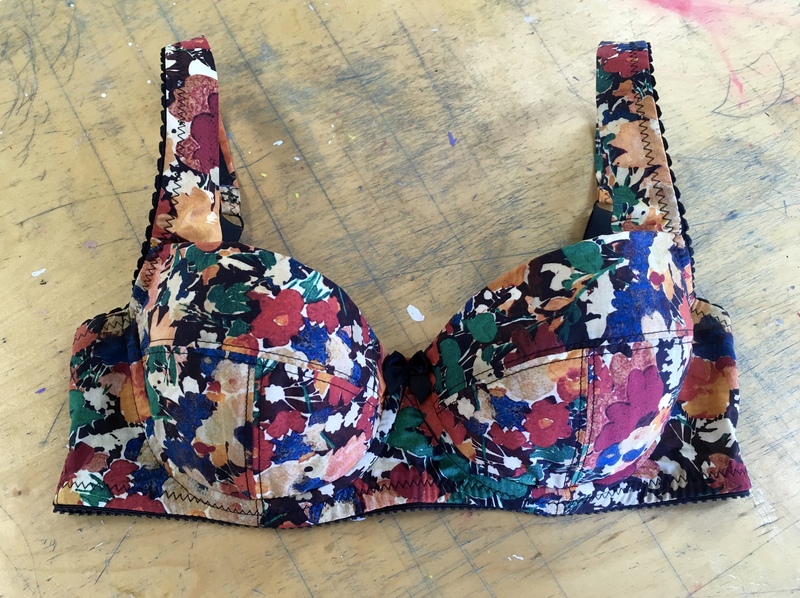 Super bra, love the Liberty, how lovely to have a liberty bra. I think this is the pattern for me although I’m quite confused on what size to make, I measure so differently to my size which is a bit confusing. Sizing is hard with bras – and lots of clothing, actually. I think you need to just trust the designer and dive in. I followed Norma’s sizing information on the pattern and simply made my first version out of fabric that I wouldn’t be devastated if the finished product didn’t fit. You won’t know until you try, right? Best of luck.